Programmes of higher education in the European Higher Education Area (EHEA) are offered at three levels – undergraduate, graduate and doctoral studies – which are usually referred to as the three cycle system. 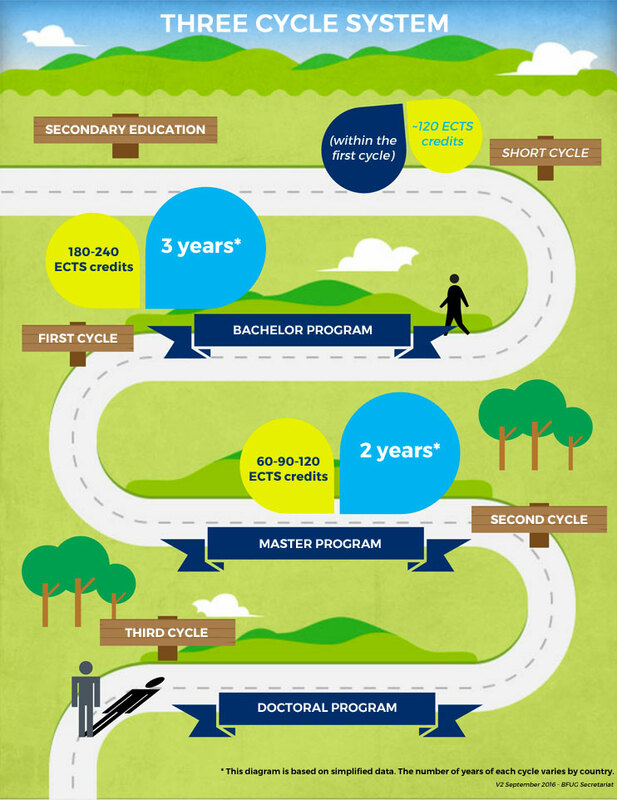 The first cycle leads to a qualification (in many countries labelled "Bachelor") which is obtained after successful completion of a study programme with 180-240 ECTS credits. Programmes of the first cycle last typically three years. The second cycle leads to a qualification (in many countries labelled "Master") which is obtained after successful completion of a study programme with 60-120 ECTS credits. These ranges for undergraduate and graduate programmes have been defined with the development of the Framework of Qualifications for the European Higher Education Area. Like the degree structure it should cater for comparable and transferable qualifications and facilitate mobility and recognition irrespective where and how learning outcomes have been achieved. European and national qualifications frameworks are based on the European Credit Transfer and Accumulations System (ECTS) in terms of quality (learning outcomes) and quantity (workload). "Conscious of the need to promote closer links between the EHEA and the ERA in a Europe of Knowledge, and of the importance of research as an integral part of higher education across Europe, Ministers consider it necessary to go beyond the present focus on two main cycles of higher education to include the doctoral level as the third cycle in the Bologna Process." "The European Higher Education Area is structured around three cycles, where each level has the function of preparing the student for the labour market, for further competence building and for active citizenship." "The core component of doctoral training is the advancement of knowledge through original research. At the same time it is recognised that doctoral training must increasingly meet the needs of an employment market that is wider than academia."